Anyone remember Exchange and X.400? You know you’re getting old when you come across a Usenet post you wrote almost 20 years ago. I came across this little memento while Googling for a much more recent item. Given the vintage of the post, I must have been referring to Exchange 4.0. Exchange has come a long way since then, although I do kind of miss X.400. PS. I’m still waiting for an answer to my question. Posted by admin on August 17, 2015 at 10:03 am under Exchange Server. It seems that a couple of weeks ago my standalone Exchange Online Protection (EOP) configuration was changed without me being involved. Basically, it looks like my default Accepted Domain was changed from type “Internal Relay” to “Authoritative” without my knowledge or consent. 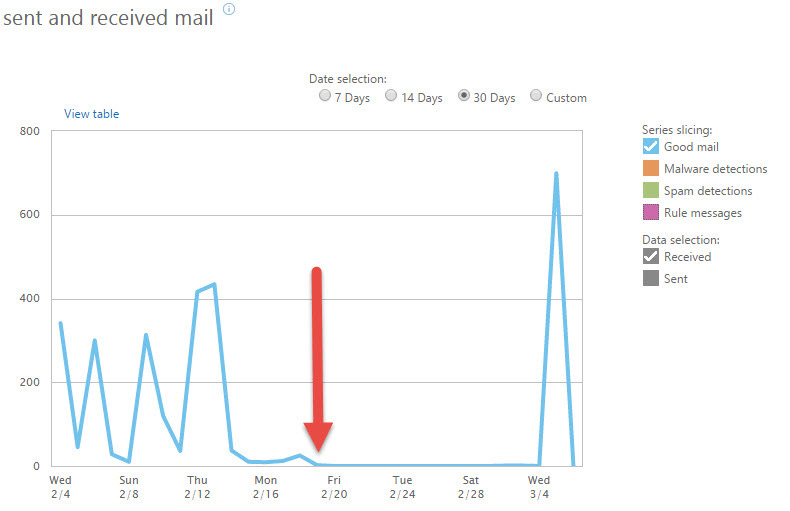 The first I knew of this was when I noticed my on-premises mail server was no longer receiving email. The current usage is low, so I didn’t notice it for a couple of weeks. After some troubleshooting I pinned the problem down to the fact that the Accepted Domain was showing as “Authoritative”. After changing it back to “Internal Relay” mail started getting delivered to my on-prem server almost immediately. I have no delegated admins for this service, so nobody could have gone rogue on me. I have also checked the admin audit logs and the only entries shown for modifying the Accepted Domains configuration are a) when I originally set it up last September and b) when I changed it back yesterday. Here are a few screenshots to show the evidence. …then the audit entries showing when I made modifications to the mail.activedir.org Accepted Domain. It only shows the two entries. The first was when I set up the service last September and the second was when I made the change from “Authoritative” to “Internal Relay”yesterday. It looks like I don’t have access to the external admin audit log report. It doesn’t appear in my EAC view (see below), so perhaps it is simply not available to EOP-only subscriptions. This might have been insightful as the the log apparently shows actions performed by datacentre administrators, which is where I believe the change was made. Given the external admin audit log report wasn’t available via the EAC, I thought I would try to invoke it via Powershell. All I got from the output was the changes that I had made in the portal, i.e. no external admin entries. RunDate            : 5/03/2015 1:44:26 a.m.
RunDate            : 7/09/2014 8:57:44 p.m.
RunDate            : 8/09/2014 1:17:15 a.m.
RunDate            : 8/09/2014 1:19:30 a.m.
RunDate            : 8/09/2014 1:24:06 a.m.
I’ve opened a support incident with Microsoft about this, so I’ll post a follow-up here when that it resolved. Anyone else out there experienced something similar? Posted by admin on March 6, 2015 at 3:20 pm under EOP, Exchange Online, Exchange Server, O365. [12/02/2014 01:14:16.0727]  [ERROR] Could not find the Exchange Mailbox Administrators Universal Security Group through its well-known GUID 29a962c2-91d6-4ab7-9e06-8728f8f842ea. Please make sure that Setup /prepareAD has been run. I sat there scratching my head for a while because what (wtf?) 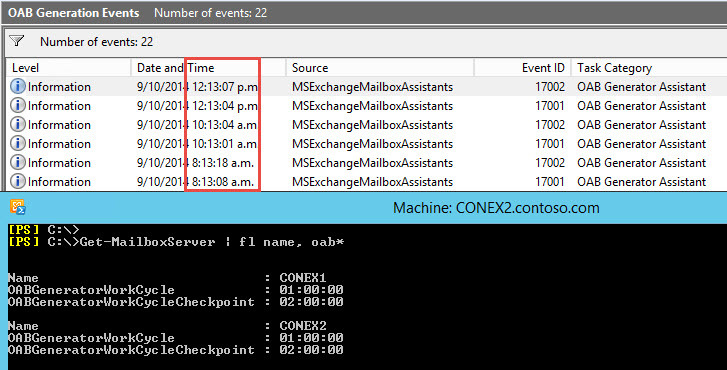 is the Exchange Mailbox Administrators group and what does it have to do with Exchange 2013. Anyway, after a journey of discovery, here’s what I found out. For some time, Exchange has used an attribute named otherWellKnownObjects on the Exchange container in the Configuration partition of AD to store information about the location of certain Exchange objects, including the default groups. One of these entries corresponds to the Organization Management group (as shown below). The resulting GUID string (29a962c2-91d6-4ab7-9e06-8728f8f842ea) matches that shown in the original error. So, basically the setup error was saying that it couldn’t find the Organization Management group. 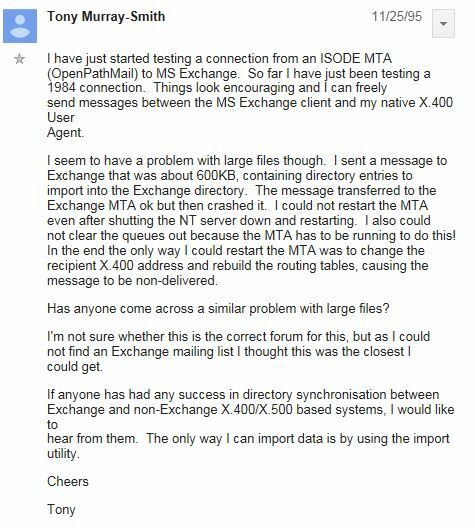 The guff about the Exchange Mailbox Administrators group must be a legacy piece of code referencing an earlier version. Once I had the new information I had a look to see if the group actually existed (it did). I then concluded that maybe AD replication hadn’t finished by the time setup got to looking for the group. I then made the executive decision to run setup with the /PrepareAD switch again. Lo and behold it finished successfully. I thought this write-up might help if you find yourself in the same boat. Posted by admin on December 8, 2014 at 3:31 pm under Active Directory, Exchange Server, PowerShell. 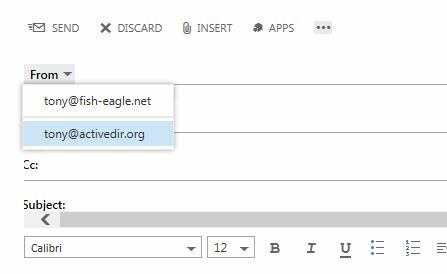 You may be aware that I run a mailing list running on a single server over at ActiveDir.org that provides a forum for disucssions on the topic of Active Directory. I set up Exchange Online Protection (EOP) to cover the mail.activedir.org namespace a little while ago as a lower-cost alternative to my previous anti-malware provider. When you first set up EOP with there are some DNS records that you are asked to configure. In fact, these *appear* to be mandatory based on the wording (see below). Without really thinking too deeply about I went ahead and configured the TXT record in DNS for SPF. With hindsight I shouldn’t have done this as I only wanted the traffic from the Internet to my on-premises mail server to be scanned for malware. I don’t need the SMTP traffic in the other direction to be scanned for malware because the only mail generated on the server is from the mailing list (list server) and as such as been scanned on the way in. 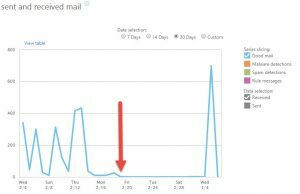 All appeared fine for a month or so and then fellow MVP Brian Arkills queried why he wasn’t receiving any email from the list. After a bit of digging, his infrastructure guy pointed to a problem with my SPF TXT record. Basically, the “-all” part of the record indicates that only the servers matching spf.protection.outlook.com are responsible for sending mail from mail.activedir.org. If a different server tries to deliver mail from that address the receiving MTA should fail the SPF check. Interestingly, most organisations treat this as a soft fail and deliver the email anyway. Not so the University of Washington, which is why Brian wasn’t receiving the list emails. What this says to the receiving MTA is to only pass the SPF check if sending server matches the A record for the namespace (i.e. my mail server). 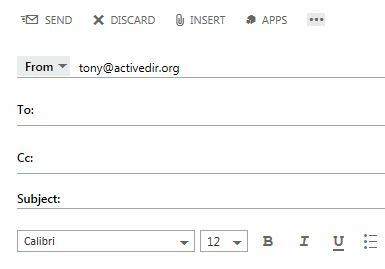 Emails coming from my mail server to non-O365 addresses need to have a SPF TXT record that matches my mail server (via the A record for mail.activedir.org). More than slightly confusing isn’t it? But then I guess I have a slightly unusual configuration. Posted by admin on November 4, 2014 at 3:15 pm under Exchange Server, O365. To be honest I’m only writing this one because I know I’ll get confused in the future and will want to refer to something authoritative. Both are set to 1 day by default. Posted by admin on October 9, 2014 at 12:21 pm under Exchange Server. If you have Send As permissions on another recipient object (e.g. 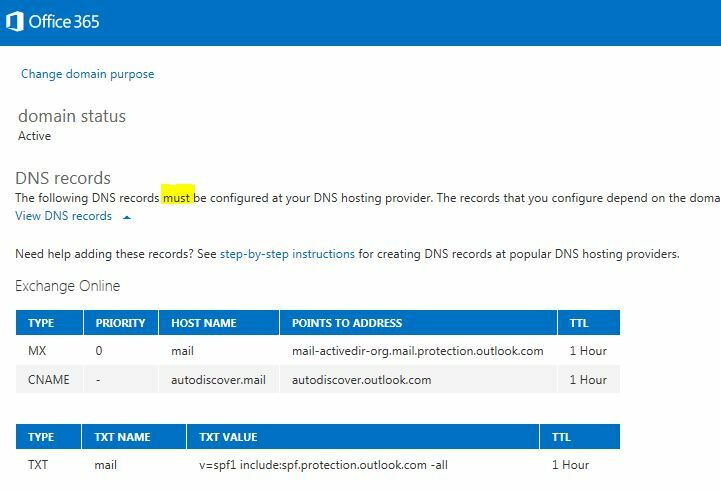 mailbox, distribution group) you have the ability to specify that object’s primary SMTP address as your “From” address when sending from Outlook and Outlook Web App (OWA). How you achieve this in OWA is not immediately obvious, so here are some (hopefully helpful) screenshots. The method works for both Exchange 2013 on-premises and Office 365 OWA. 1. 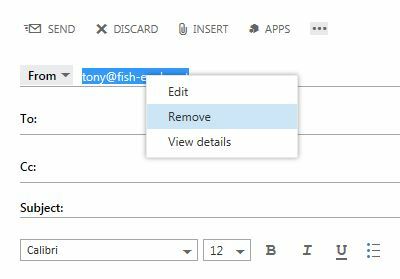 In the New Mail pane, click on the three dots to expose additional options. Select “Show From”. 2. With the From field visible, right-click the email address shown and select “Remove”. 3. Click on the drop-down arrow in the From field. From there select the address you which to send from/send as. 4. The address should now appear in the From field. When you send the email it will send from the address shown. That’s all there is to it. It’s not rocket science, but then it’s not blindingly obvious either. Posted by admin on October 7, 2014 at 2:11 pm under Exchange Server. I upgraded a client’s CAS servers recently from Exchange 2007 Service Pack 2 Update Rollup 5 to Service Pack 3 Update Rollup 13 in preparation for upgrade to Exchange 2013. Following the restart after the Update Rollup had completed I found I could not log into OWA. Instead I got a blank page with a URL similar to the one shown below. I found several suggestions for what might be the problem on the web, but the one that worked for me was to run the UpdateOwa.ps1 Powershell script in the Bin folder under the Exchange installation path. Posted by admin on September 4, 2014 at 1:16 pm under Exchange Server. When you install a new version of Exchange or apply a Cumulative Update certain AD attributes are updated to reflect the change. The updates are made in three different directory partitions (also known as naming contexts): Schema, Configuration and Domain. The following Microsoft TechNet article is a good reference for the different versions and the corresponding attribute values. Posted by admin on July 29, 2014 at 3:50 pm under Active Directory, Exchange Server, PowerShell, Scripting.